This application note shows how to connect Cisco Unified CallManager to Yeastar TE gateway via SIP trunking. This guide has been tested with Yeastar TE100 and CUCM version: 8.6.2. After connecting Yeastar TE100 and Cisco Unified CallManager, physical E1 trunk will be extended on Cisco Unified CallManager. Make outbound calls from CUCM via the E1 trunks of Yeastar TE100. 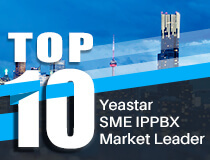 Receive calls from the E1 trunk of Yeastar TE100 at CUCM. A E1 trunk from provider is connected to TE100. Please make sure Cisco CallManager Service is activated on CUCM. 1. Log in to the CM Administration Web interface. 2. In the field “Navigation” on the top right corner, select Cisco Unified Serviceability and click Go. 3. Under Tools click Service Activation. 4. Check if the Service “Cisco CallManager” is activated. Step 1. Create a SPS trunk on TE100 to CUCM. Path: Gateway--VOIP Settings--VOIP trunk--Add VOIP Trunk. Step 2. Check the status of this trunk. After creating the SIP trunk, we can check the status of this trunk, it should be OK(green). Please change the “Outgoing Transport Type” to UDP, otherwise the outgoing calls would fail. In version 9.x, the Non Secure SIP Trunk Profile already exists, but it must be modified. 1)On Unified CM, go to SystemSecuritySIP Trunk Security Profile. 2)Select Non Secure SIP Trunk Profile. 1)On Unified CM, go to DeviceDevice SettingsSIP Profile. 2)Click Copy against the Standard SIP Profile. 1)On Unified CM, go to DeviceTrunk. 3)Select a Trunk Type of SIP Trunk. Mark the field modified compared with default settings. Step 4: Configure Route Pattern for the SIP Trunk. 1)On Unified CM, go to Call RoutingRoute/HuntRoute Pattern. Set Route Pattern to 5XXXXXX,which means all 7-digit calls starting with 5 will be sent to TE100 via this SIP Trunk. Besides, you can set up multiple Route Patterns for a SIP trunk. Step 5: Check the status of this trunk. On Unified CM, go to DeviceTrunk, click Find. In this section, we will configure incoming calls to CUCM. Create a route from TE100 to CUCM. Path: Gateway->Route Settings->Route List->Add New Route. Strip: 7, in order to translate the call to CUCM’s extension, we stip the original DID first. All the calls from E1 trunk will be sent to CUCM via SPS trunk. In this section, we configure outbound calls for CUCM’s extensions. Step 2: Set DOD for CUCM extension. For example, extension 9456 will use E1 DOD 5551000 to make outside calls via E1. Step 3: Make test calls. After settings, all the calls from CUCM will be routed to E1.